The new, NSF-funded campus cyberinfrastructure engineer position will provide technical expertise and leadership to realize the potential of existing University cyberinfrastructure investments and to guide strategy for future investments for research and education. The National Science Foundation (NSF) has awarded Syracuse University $396,098 to fund a full-time campus cyberinfrastructure engineer (CIE) position for two years. The engineer will provide technical expertise and leadership to realize the potential of existing University cyberinfrastructure investments and to guide strategy for future investments for research and education. The position is expected to increase research computing output, including scholarly output and funded research. The CIE will engage with a broad spectrum of campus researchers, allowing the University to respond to current needs and opportunities in advancing scientific discovery. The job includes working with researchers to better understand their needs and to recommend available computing resources. The CIE will be well-versed in research computing technologies, including high-throughput computing, high-performance computing, virtualization and operating systems. The person will have a thorough knowledge of available research computing resources available at Syracuse University and provide an aggregation point for identifying common research needs, problems and resources among the diverse Syracuse University research community. This aggregation is intended to build a sense of community across a diverse set of research computing efforts on campus, identify tools that might solve problems in multiple disciplines and assist with reducing duplicative research environments where multiple researchers would benefit from pooling resources. Beyond campus, the CIE will interact with national research computing organizations to become familiar with available tools and resources, innovative approaches, and best practices. A sample list of research organizations the CIE is expected to interact with includes Open Science Grid, HTCondor and XSEDE. The CIE will evaluate the appropriate use of national resources for Syracuse University researchers. The CIE will also represent Syracuse University on the national stage as a catalyst for growing a community of campus-level cyberinfrastructure engineering professionals. “I am ecstatic about this award and the new position,” says M. Lisa Manning, associate professor of physics in the College of Arts and Sciences. A computational researcher in soft matter physics, Manning runs a lot of custom high-throughput and high-performance computer code on a local cluster at the University’s Green Data Center and on OrangeGrid. She works with wide-ranging applications from designing new structural materials such as bulk metallic glasses to understanding biological processes such as embryonic development and cancer metastasis. The CIE will report to co-principal investigator Sedore, who has led the research computing efforts of Information Technology Services (ITS). A subcommittee of the Research Computing Advisory Council will ensure that the work of the CIE satisfies the needs of the University’s research and education community, and to provide guidance and feedback to Sedore and the CIE. Subcommittee members are principal investigator Scozzafava, and co-principal investigators Green, Manning and Duncan Brown, associate professor of physics. As outlined in the proposal submitted to NSF, after 18 months the subcommittee will review the outcomes and ongoing work to make a recommendation regarding continuing funding of the CIE position by Syracuse University. 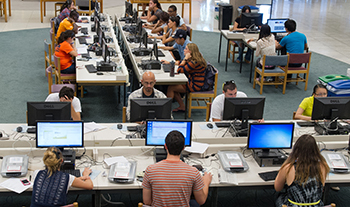 For information about research computing at Syracuse University, visit http://researchcomputing.syr.edu. The CIE position opening will be posted soon at https://SUJobOpps.